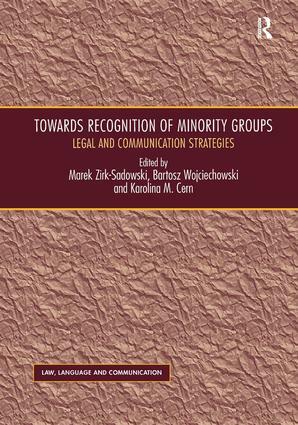 This volume analyses current debates concerning problems in the nature, justification, and legal protection of human rights for minorities, with reference to the issues surrounding social milieu as a source of any legitimized law, which is in itself in need of legal recognition as well as being an object of legal protection. With contributions from a global network of scientists across several continents, the work examines the debate dedicated to the understanding of the normative framework, expressed in terms of human rights that guarantee autonomous action in public and private for minority groups as well as individuals. The chapters go on to study the particular claims that need to be audible and visible for others in the public sphere with reference to the legal protection of human rights. The work concludes with the completion of an interpretative circle debating the issues of legal consensus and legal identity with respect to the specificity of the patterns and modes guiding human interactions. Going beyond the legal analysis to discuss communication strategies in human rights, this collection will be of great interest to those studying the philosophy and theory of law, practical philosophy in general, political sciences and theory of democracy. Marek Zirk-Sadowski is Professor of the Theory and Philosophy of Law at the University of Å�Ã³dÅº, Poland. His scholarship focuses on the theory of judicial application and the interpretation of law, the theory of legal values, and the philosophy of European law. He has published more than 120 works in these fields. Since 1994, he has been a judge and since 2004 he has been vice-president of the Supreme Administrative Court of Poland. Bartosz Wojciechowski is Associate Professor in the Department of Legal Theory and the Philosophy of Law, at the Law and Administration Faculty, University of Å�Ã³dÅº, Poland. He has published more than 60 articles in Polish, German, English and Czech. Since 2002, he has been a judge, and since 2012 has been a judge of the Supreme Administrative Court of Poland. Karolina M. Cern is Assistant Professor in the Department of Philosophy, Faculty of Social Sciences, Chair of Ethics, Adam Mickiewicz University, PoznaÅ„, Poland, Secretary of the Commission of Philosophy at the PoznaÅ„ Society of Friends of Arts and Sciences; Visiting Research Associate in the Institute of Education, University of London (VII 2012- VI 2013). She is an author of three monographs and has contributed to a number of journal articles and eight edited collections. This series encourages innovative and integrated perspectives within and across the boundaries of law, language and communication, with particular emphasis on issues of communication in specialized socio-legal and professional contexts. It seeks to bring together a range of diverse yet cumulative research traditions related to these fields in order to identify and encourage interdisciplinary research. The series welcomes proposals - both edited collections as well as single authored monographs - emphasizing critical approaches to law, language and communication, identifying and discussing issues, proposing solutions to problems, offering analyses in areas such as legal construction, interpretation, translation and de-codification. Anne Wagner is Professor of Legal Semiotics and Research Professor at Centre de Recherche Droits & Perspectives du Droit, équipe René Demogue, Lille University, France. She is the Editor-in-Chief of the International Journal for the Semiotics of Law (Springer) and President of the International Roundtables for the Semiotics of Law. She has been awarded the National Research Grant for her research career. Her main research interests include semiotics, verbal and non-verbal sign system analyses, language and law, legal culture and heritage, legal translation, legal terminology, and legal discourse studies. Vijay K. Bhatia, formerly Professor of English, City University of Hong Kong, is now Adjunct Professor at Chinese University of Hong Kong, and Visiting Professor at the Hellenic American University, Athens (Greece). He is also the founding President of the Languages for Specific Purposes and Professional Communication Association for Asia-Pacific. His research interests include Critical Genre Analysis, academic and professional discourses in legal, business, newspaper, and promotional contexts; ESP and Professional Communication; simplification of legal and other public documents; intercultural and cross-disciplinary variations in professional genres.